TONI&GUY Wimbledon opened in the town in 1995. 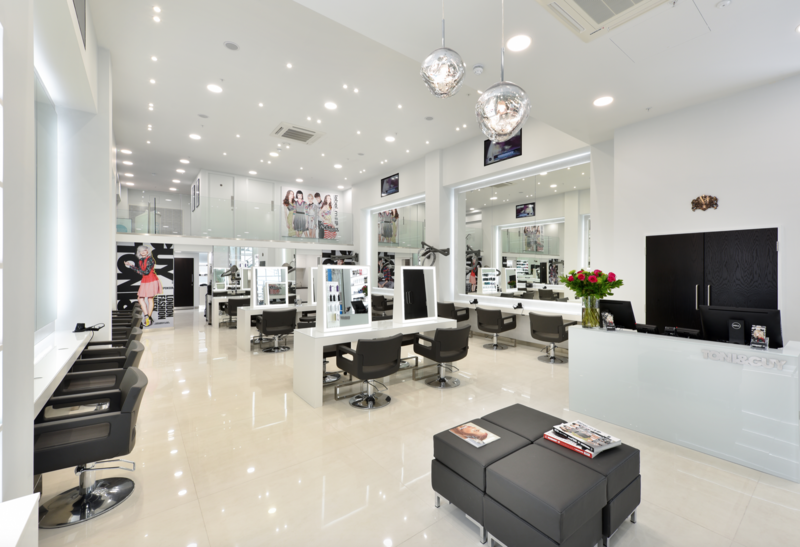 As a strong team of passionate stylists and technicians we will ensure your visit to TONI&GUY is the ultimate salon experience. In February 2017 we relocated to the 1st floor of Centre Court above Marks & Spencer, to a beautiful bright new salon but with the same talented team. Our stylists and technicians are on hand to give you expert advice and create hair that is individual and easy to live with, interpreting fashion trends with versatile wearable styles. Members of our salon are part of the TONI&GUY Session Team and have worked alongside the International Artistic Team on catwalk shows such as London Fashion Week and Brits awards, bringing the latest trends from the catwalk and showbiz. Members of our Colour team hold the prestigious L’Oreal Colour Degree and the Wella colour expert, so your hair will be in safe hands with our technicians. We offer many additional services including Bridal and Occasion hair and the Keratin Smoothing blow-dry. We offer natural and discrete grey blending for the gents who want to discretely blend away those grey hairs. Our wide range of haircare products include label.m, Kerastase, GHD, L’Oreal and Tangle Teezer SmartBond and Olaplex, everything you need to keep you and your hair looking fabulous. We also have our aesthetics clinic in the salon Eden at TONI&GUY, offering the latest in skin rejuvenation and beauty treatments such as laser, Venus Freeze and IPL therapy. For more information on our services please speak to our friendly reception team who will be delighted to help. Parking is available in the underground car park at the shopping centre. Really great cut and the right mixture of listening and advising re length. Very professional and super result. Faye. Really wonderful stylist and am so pleased with my hair. I asked him layered and the hair is almost straight. Asked layered fringe and he cut it straight. Asked to blow dry more natural as possible and ended up with curls at the ends and with shining spray. Will not repeat with Mustafa. Thank you very much for taking time to write the review above. We are very sorry to hear that you weren’t happy with the result of your haircut. Our sincere apologies that this has happened, we take all complaints very seriously and we are taking all the necessary steps that this doesn't happen again. Would you kindly let us speak to you regarding your experience? Please do give us a call on 02089715057 and speak to either Katrina our manager. Was worried when my original stylist went on mat leave but Niamh is brilliant! Love the new haircut. Thank you so much for taking time to write such a lovely review. We are really happy to hear that you had a great experience on your last visit in the salon. The whole team loves to look after you. Amazing results. Emma always gets my colour perfect. We are delighted to hear that you were pleased with your colour on your last visit to Toni&Guy Wimbledon. We are glad to hear that Georgia did a fantastic job and that you left the salon very happy with the results. Left feeling a million dollars! Thank you so much for taking time to write the review above. We are delighted to hear that you had a fab experience on your last visit to the salon and left feeling like a million dollars!! Hair cut and blow dry. We are delighted to hear that you had an excellent pixie on your last visit in the salon. Indeed, Thanasis is a great stylist and we are lucky to have him here with us. Thank you for your kind feedback, we are delighted to hear that you had a lovely service. Really good cut. He was very focused precise and extremely thorough. He is a real professional. I like Elouise washing my hair and giving me a head massage. We are glad to hear you had a great service from Sylvestre and Eloize. Again and again, Katrina and her team never fail to create a lovely atmosphere during my visits. It’s much more than ‘having a hair cut’, they really care about how I feel, what I’m looking for and always give me the right advice. I’ve been a client for more than 6 years and always leave with a big smile in my face. Katrina is an amazing professional and I cannot recommend her and her team enough! We are delighted to hear that you had such a great service at the salon and that you are always well looked after. Undoubtedly Katrina is amazing and really gifted, the salon wouldn't be the same without her. Caroline did my colour today. Lovely lady, worked very hard to give me the colour I wanted. Professional and so friendly too! We are delighted to hear that you were pleased with your colour results on your last visit to the salon. I was booked in to see Michelle but Michelle was running 20 mins late so Rachel did my hair. She did a good job I love the result. We are delighted to hear that you loved your colour on your last visit to Toni&Guy Wimbledon. Thank you to Katrina and Nichola for a wonderful morning of relaxation and pampering. My hair has never looked better - the cut and colour is amazing! An incredibly skilled and professional team. Look forward to seeing you again soon. We are delighted to hear that, not only you had such a great service at the salon but also found the whole experience relaxing and left the salon with fabulous hair.. Fantastic haircut. Thansis is very professional and personable. My hair looks great! Highly recommended. We are delighted to hear that you had a fab experience on your last visit in the salon. Indeed, Thanasis is a great stylist and we are lucky to have him here with us.